Mule deer have a very long traditional migration route. Deer come from as far north as the Jarbidge Mountains on the Idaho border to spend winters on Spruce Mountain, which gets very little snow. Spruce is south of Wells Nevada, in the rain shadow of the Ruby Mountains. Millions of dollars have been spent on a series of underpasses to get the deer safely across Highway 93 and I-80 and on down to Spruce. Conditions are harsh. Very slow-growing pinyon and juniper, sometimes of very short stature, are found here. BLM has long lusted to destroy the trees. Some mid-slope areas on Spruce had been burned and chained for cattle forage in the 1960s-70s. Starting in the early 2000s, BLM again plotted to destroy the trees. First, the agency approved major sagebrush killing projects on the south and east side of the Range extending west over to the Valley Mountain area. 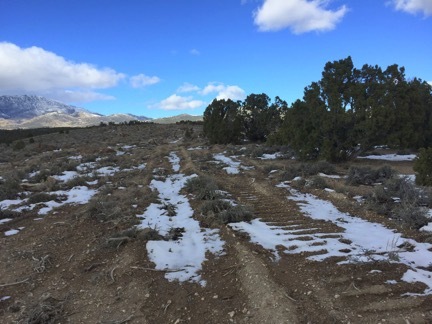 The mature and old growth sagebrush that had been the densest known area of pygmy rabbit habitat in Elko County was destroyed for cattle forage. Crested wheatgrass was planted in its place. In some other areas, nothing but weeds grew. 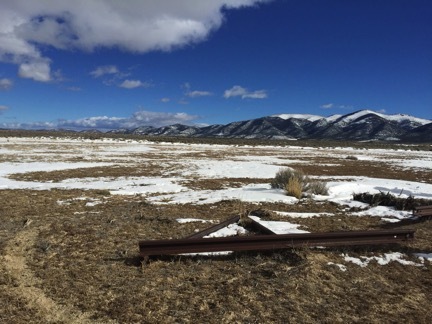 The Elko NDOW non-game biologist got in trouble for daring to document the importance of the sage habitat to pygmy rabbits – before it “converted” to crested wheatgrass for cattle forage. Border between “treated” area and untreated sage. Tiny ancient pinyon and juniper trees were chained and destroyed in the neighboring Valley Mountain area. These trees were at times only 8 feet tall, yet 2 feet in diameter. Violently uprooted in an instant. Then, around 2005, BLM issued an EA proposing massive treatments/tree massacres at Spruce. Unlike the chainings and burns of the 1960s, now the excuse was food for the wintering mule deer. Litigation halted the first mammoth chaining, burning, and clearcutting EA at Spruce. BLM was getting ready to burn the first area, and had cut trees around the boundary to control the fire. 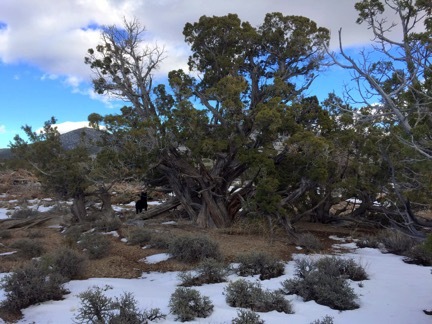 BLM and a range researcher who helped plan the project as part of a supposed “sage-step restoration” study, Robin Tausch, insisted the trees at the site were young invaders. I counted the growth rings. Cut trees were 250 years old. A federal judge issued a Restraining Order. I had previously been on a field trip where the same researcher denied the past role of mining in altering forested vegetation in the region. At Spruce, he claimed the trees were invading, encroaching, taking over, and the sites occupied by trees were NOT supposed to be tree sites. These same claims were made while standing in areas with remnant basal areas of old burned trees 3 feet in diameter, amid pieces of old purple glass. Ever-intent on attacking the trees at Spruce, BLM came back with a new EA in 2012. This EA expanded the tree killing to lower elevations, guaranteeing destruction of very old very slow growing trees, and proliferation of cheatgrass. It authorized burning a large area, despite the ever-increasing threat of cheatgrass at Spruce, plus other kinds of clear-cutting. I appealed the EA. IBLA, BLM’s Appeal body, as it always does, sided 100 percent with BLM, and the Appeal was not upheld. Regrettably, there was no federal court challenge. Attorneys were occupied elsewhere. The Wells BLM Manager had said “Oh, we’re just going to do a little bit – maybe”. I recall inquiring for a couple of years about what was taking place and was told “not much”. I returned to Spruce in November 2015, with Will Falk and Max Wilbert, in a Nevada trip overview of BLM assaults on pinyon-juniper forests. Driving skirting the south end of the Mountain range arc, we saw red brown recently killed trees from a distance. We drove as far as we could in melting snow and mud, and walked crosscountry, towards the cleared area. We soon saw that BLM had destroyed old, very slow growing trees on the south flanks of Spruce. Old juniper tree that escaped the chaining. Sadly, remains of many other old trees trees were strewn about the chaining. 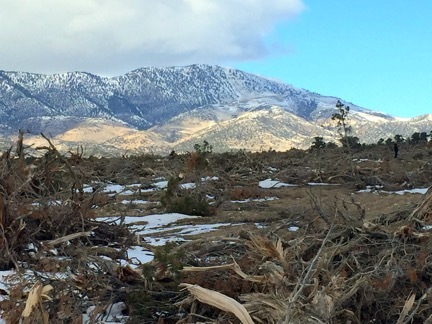 Old pinyon pine laid to waste. When I got back to Boise, I looked at the satellite images. I saw several other areas of recent chainings at Spruce – with blocks of brown trees visible in contrast to green live forests. I called the BLM. The new Manager knew nothing about chainings at Spruce, and was told that it must have happened under her predecessor. She did say she knew they were going to be doing “pile burning”. WHY do this? The deer traditionally travel vast distances to come to largely forested Spruce Mountain. So what does BLM (with NDOW “game” biologists and trophy hunters cheering them on) – but DESTROY the complex Spruce vegetation communities that drew the deer in the first place. They claim the deer need more grass. If deer need more grass, then control the rapacious livestock grazing that takes place across Elko County. 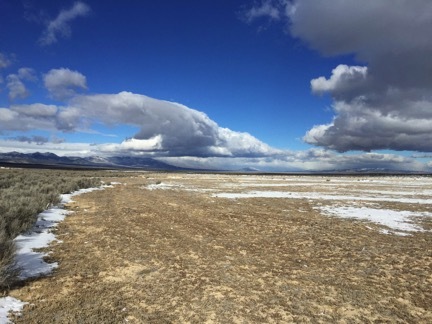 The projects cannot be justified in the name of sage-grouse – as Spruce is very, very marginal grouse habitat (too harsh and dry), with no current leks nearby. Plus BLM just authorized a new gold mine, in the neighboring Pequops Range to the east, making sure this region south of I-80 never sees any more birds – and guaranteeing further perforation in an ever-shrinking range with growing internal gaps. Ironically, right next to the southern Spruce chainings, in summer 2015, BLM issued a proposed trespass decision to Spruce Mountain LLC, Madeleine Pickens grazing operation. She had bought the base property ranch and acquired a nearly million acre grazing permit in the Spruce country .She had hoped to release wild horses captured by BLM in its helicopter round ups there, and applied to do this. Fierce rancher opposition struck the project down. Now the lands are again grazed by cattle, and the operation appears to be falling into the typical livestock industry mindset. The Spruce Pickens ranching operation bladed off 28 acres in rebuilding a cattle water pipeline. 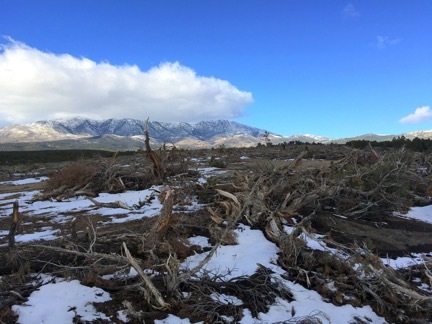 BLM issued a proposed trespass decision, with substantial fines, stating: 685 trees were destroyed and left in slash piles over 8 feet tall. But the agency itself had just wantonly wasted many hundreds of acres of trees in the same area. The very damage BLM accuses Pickens of must apply to this rogue agency itself. It seems to us that, what is fair for Spruce LLC is fair for BLM. BLM owes the public, the black-throated gray warblers, Townsend’s solitaires, American robins, long-eared owls, kestrels, ferruginous hawks, pinyon jays and other wildlife that inhabited its chaining tree massacre MILLIONS of DOLLARS. But no amount of money will make up for BLM’s own senseless BLM damage. Note we do NOT in any way condone the wanton waste of the trees for the Pickens cow pipeline, but use this to illustrate the astonishing agency hypocrisy in the face of the damage BLM’s “treatments” are inflicting with impunity across the West.